Our printer has been on the fritz lately and I really wanted to try these out before posting them...but since I'm pretty sure they will be fun, I figured I'd share them even before I get to play along myself at home! 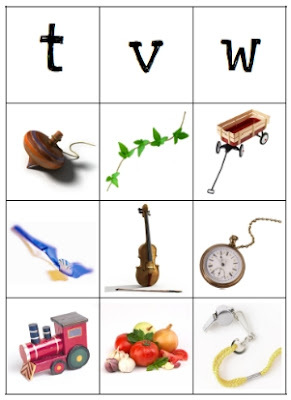 Match the pictures to their beginning letter sound. You can also use the picture cards to practice identifying objects with your child. You can download and print the pdf by clicking here for the printable. Be sure to download the long and short vowel cards that I posted as well! I really like those. I will be printing them. Thank you! I just downloaded a copy. They look great! Where do you get the photos for your cards? Do you take them yourself? The cards are "designed to help identify the beginning consonant sound in words", but the word "train" (a train is one of the images shown for "T") doesn't begin with the simplest consonant sound usually associated with "T". It's possible that the maker of the cards meant for the child to see the picture and think not "train" but "toy", of course. It can be hard to see things from the perspective of a child learning to read if you already read yourself, but trying to can sometimes help avoid unnecessary difficulties for the child. Also, learning the names of the letters can sometimes interfere with learning the sounds they make in words. For example, my son thought for a while (and logically enough)that the sound made by the letter "W" was "duh." I'm an unschooler and I choose to mostly let him discover things on his own, so I didn't teach him the alphabet until he asked me to. I realize that most parents will choose to teach the alphabet first, so I'm not saying they shouldn't. I'm just pointing out a few things that might cause confusion. Love it!!! Keep the ideas coming! Thanks again for sharing. My daughter just finished learning all the letters today so this will be a great next step.